"Pete Comley is the most dedicated and fanatical audio collector and expeditioner I know. He really put his heart in to field recording for (Alan) Wake, just like I knew he would." 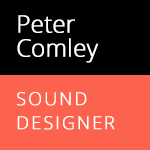 "Peter is an extremely passionate and talented sound designer. It's hard to find guys that are so focused on sound design, and he's a true gem." "When I need someone as passionate and meticulous about sound as I am, Peter is my first call."